Every Christmas, we buy a Hallmark ornament to add to the tree. Not sure how this started, but for the most part, we have pretty big occasions in our lives each year. This year must have been a boring year because no occassion stood out. Once it was ‘our first home’, then ‘our engagement’, ‘wedding’, ‘europe’, and 2011? Ummm. We… went to Punta Cana in the Dominican Republic. Apparently, Hallmark discriminates against making ornaments specifically about Punta Cana so that was out. We redecorated our home. Not too many ornaments about that either. Then it hit me. Of course… everything that required something in memory of 2011 always defaulted to ‘the year of the trapped skunk in our back yard’. Perfect for an ornament. 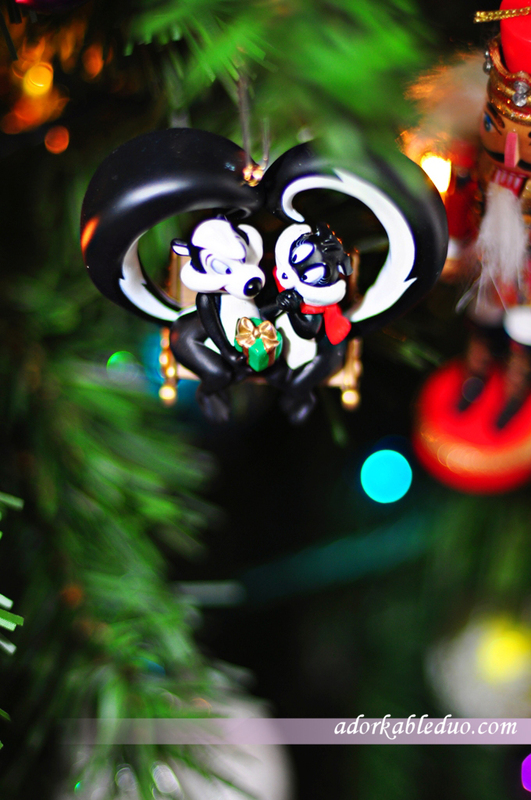 Hallmark PROBABLY has an ornament about killing skunks and having your house smell for a month, right? That’s right. It’s even better because we dressed up as Pepe Le Pew and Penelope for Halloween. Crisis averted.